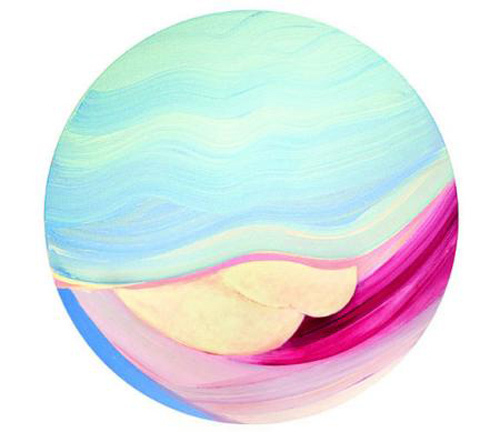 Sandi Slone, Botticelli, 2008, acrylic on canvas, 36" diameter. In “The Buxom Eye,” longtime New York–based artist Sandi Slone continues her passionate affair with paint’s kinetic, sensuous qualities, revisiting some of the unusual imagemaking processes she developed in the 1970s. In works such as Leda, 1977, Slone created sumptuous, velvety surfaces by sweeping planes of paint across the canvas using large push brooms. These early works—many of them over ninety inches tall—packed a political, as well as painterly, punch, demonstrating that a humble cleaning tool could serve a female artist’s ambitious devotion to creating beauty. Over the years, Slone has also performed live with her pigments, building abstract topographies on the floor and using her body like a brush to smear and blend the paint. These focused, elegant performances result in a kind of metaphysical portraiture wherein the energy of the artist’s body is registered, abstractly, within a temporary material encounter. “The Buxom Eye” offers a number of strangely corporeal, ocular canvases composed of curvilinear bands of soft, muted color. The bands overlap and nestle into one another like folds of skin or fabric. Though squishy soft, the broad strokes suggest a strong directional current in competition with the work’s circular shape. The effect is intensely visceral and at times unnerving, like gazing upside down at a lover’s face. Slone’s vision of the world is as fleshy and interiorized as it is atmospheric, drawing the viewer’s attention to the fragile relationship between the body and its surroundings. In this respect, her work is as political today as it was in the 1970s.